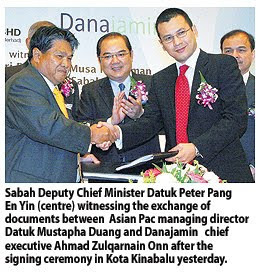 ASIAN Pac Holdings Bhd wants to make KK Times Square II, the second phase of its mall and office project in the heart of Kota Kinabalu, Sabah, 'the most fashionable address in the city'. The second phase, a 3.7 million sq ft mall and service apartments, is being developed by Syarikat Kapasi Sdn Bhd, a subsidiary of Asian Pac. "Much thought has been put into its design with the aim of making it into the most fashionable address and shopping destination in the city," said Asian Pac chairman Tan Sri Megat Najmuddin Megat Khas. Strategically located along the coastal highway within the city's business district, the 15-acre development comprises a four-storey shopping mall and serviced apartments. The shopping centre, to be called The Mall, will have 670,000 sq ft of retail units available for lease only and not for sale. Parkson is the confirmed anchor tenant. There will also be five blocks of serviced apartments. KK Times Square II's third component is 41 units of exterior shops which will be sold. Construction of KK Times Square II is expected to start this year. Megat Najmuddin was speaking to reporters at the signing ceremony between Kapasi and Danajamin Nasional Bhd for a financial guarantee facility agreement where Danajamin will guarantee Kapasi's RM200 million five-year Private Debt Securities programme. KUALA LUMPUR: Property developer SP Setia Bhd posted a 26% increase in net profit to RM51.2mil for its second quarter ended April 30, compared with RM40.52mil in the corresponding period last year. Revenue for the second quarter increased to RM409.1mil from RM352.2mil previously. In a filing to Bursa Malaysia yesterday, the company said the improved performance was mainly due to better sales in residential and commercial properties in the Klang Valley and Johor Baru. SP Setia said it continued to set new sales benchmarks with second-quarter sales of RM598mil and cumulative six-month sales of RM1.206bil. The management expects to achieve its sales target of RM2bil for the financial year ending Oct 31, 2010 (FY10) on the back of strong sales momentum and upbeat consumer sentiment. Underpinned by the strength of sales in established markets, SP Setia said it would continue to strengthen its position and standing in new market segments, locally and abroad. “This will broaden our earnings base and ensure continued dynamism and growth over the long run,” it said. In a separate filing, the company said it had proposed an interim dividend of 6 sen per share less income tax of 25% for FY10. SP Setia Bhd, Malaysia’s biggest property developer, rose to a one-month high after profit in the second quarter ended April 30 climbed 26 per cent from a year earlier. SP Setia posted a higher pre-tax profit of RM71 million for its second quarter ended April 30, 2010, compared with RM55.7 million in the same period last year. This was mainly attributed to profit from residential and commercial properties in the Klang Valley and Johor Baru, it said in a filing to Bursa Malaysia on Thursday. SP Setia's revenue for the second quarter increased to RM409.1 million from RM352.2 million while the net profit rose by 26 per cent to RM51.2 million from RM40.5 million previously. The stock gained 1 per cent to RM4.07 at 9:03 am local time in Kuala Lumpur trading, set for its highest close since May 13. Meanwhile, the group has said that it continues to set new sales benchmarks with second-quarter sales of RM598 million and cumulative six-month sales of RM1.206 billion. As at May 31, the group's sales for the first seven months totalled RM1.438 billion, with the sale and purchase agreements signed. SP Setia said the management was confident that the group's financial year 2010 sales target of RM2 billion was achievable based on the strong sales momentum and upbeat consumer sentiment. Underpinned by the strength of sales in established markets, the group said it continued to strive to strengthen its positioning and standing in new market segments, both locally and abroad. "This will broaden the group's earnings base and ensure continued dynamism and growth over the long run," it added. KUALA LUMPUR: Sunway Holdings Bhd and Sri Lanka-based Dasa Tourist are looking at the possibility of forming a joint venture to develop a 34-storey tower in Colombo, Sri Lanka. In a statement yesterday, Sunway said it had entered into a memorandum of understanding (MoU) with Dasa Tourist for the proposed project which has an estimated gross development value of RM250mil. Dasa Tourist is a wholly-owned subsidiary of the Dasa Group. Under the MoU, Sunway shall undertake feasibility studies and market research to ascertain the viability of the proposed property project. The move is in line with Sunway’s strategy to invest in industries of growing economies in which it has a core expertise. It would also provide Sunway the opportunity to explore the feasibility of expanding its property development business in Sri Lanka by developing a parcel of land in an attractive location. The proposed project is located on a plot of prime freehold land in the premium mixed-use zone of Bambalapitiya in District Colombo 4. It has the potential to generate a total sellable area of 400,000 square feet. PROPERTY developer Magna Prima Bhd is optimistic of net profit in the financial year ending December 31 2011 recovering to 2007 and 2008 levels of around RM27 million. Last year, its net profit declined to RM6.67 million as most of its projects neared completion. The projected numbers, however, are based on current accounting standards, Magna Prima chief executive officer Yoong Nim Chee said. He added that the company has projected some RM150 million to RM200 million revenue this financial year from RM1 billion of projects that it will be launching. "This year, revenue will be maintained at around last year's level of RM191 million, but profit will be up primarily because we are starting new projects with better profit profiles," Yoong told reporters after Magna Prima's annual general meeting in Kuala Lumpur yesterday. The projects include residential developments in Selayang, Selangor, and Bukit Jalil in Kuala Lumpur. Magna Prima will also be launching commercial projects in Shah Alam and Petaling Jaya, both in Selangor, and in Jalan Kuching, Kuala Lumpur. Magna Prima, which saw some 16.8 per cent of revenue last year from construction and engineering activities, said it will not be aggressively seeking external construction jobs but will focus on in-house projects. With the exception of the land in Jalan Ampang on which the Lai Meng Chinese School sits, the group expects to complete all of its ongoing projects by 2014. Currently, it has some 30.38ha landbank. It also expects to begin the proposed RM1.3 billion commercial and residential development on the site of the Lai Meng Chinese School in 2012 as planned and to complete it by 2015. The company is hopeful that the Ministry of Education will give its approval within the next three months for the school to be relocated to Bukit Jalil. Magna Prima, which will provide advice on design in the construction of the school, said that tenders will be called out and that it will also bid for the project. While Yoong was not able to state the estimated project value, he said the school was looking at including a swimming pool and an auditorium. To a question on new shareholders Lee Ban Chuan and Lee Hing Lee, who have emerged in the company via Fantastic Realty Sdn Bhd which now owns 15.41 per cent of Magna Prima, Yoong said he understood that they were passive investors and that there had been no indication that they would raise their stake in the company. On the police report made against its former chief executive officer, Lim Ching Choy, for alleged criminal breach of trust, Yoong said that there had been no developments.